A little disclaimer I’ve never been a big Thor fan. Every single time I picked up the series the mythology and language always pushed me away from the title. That all changed with Jason Aaron’s last volume of Thor. The mystery of who the new Thor was excited me. I liked that Aaron used thought bubbles to allow the audience to see what the mysterious Thor was thinking without heavy Norse dialogue. 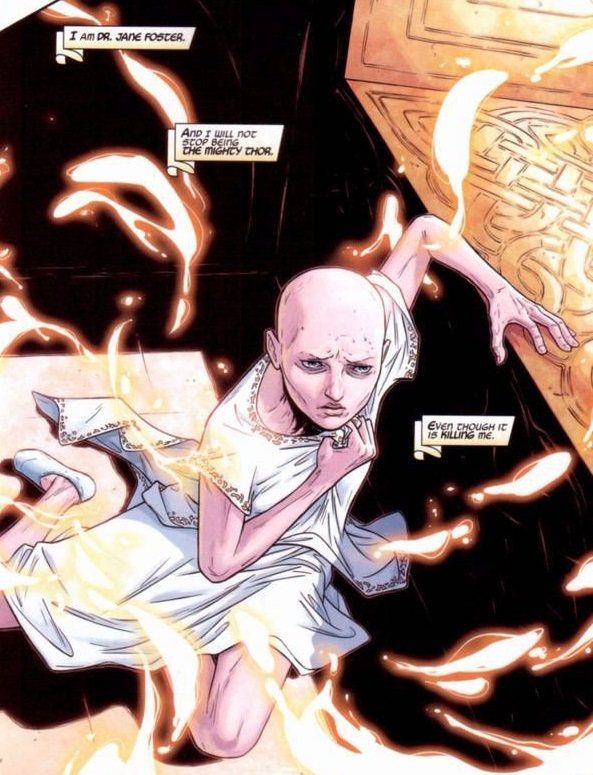 I was very excited when it was revealed that Jane Foster was the new Thor. The last page of Thor #8 blew me away. Jane deserves to be Thor because she knows what it means to be mortal. She knows that every day is precious. 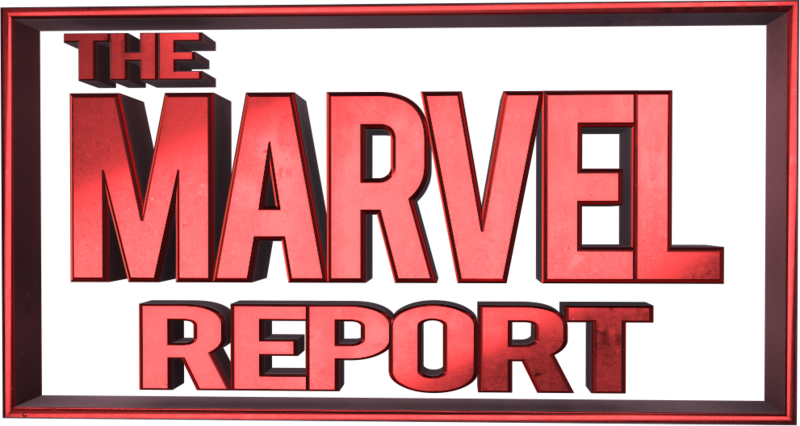 It took eight issues for the reveal of the new Thor. Then Secret Wars came and we couldn’t get the aftermath of Thor #8 right away. 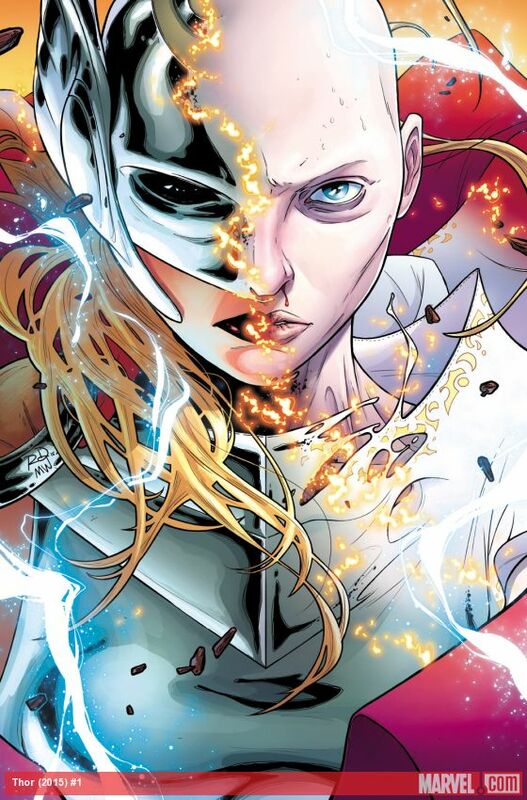 Seven months later and we finally get to see what it means for Jane Foster to be The Mighty Thor. 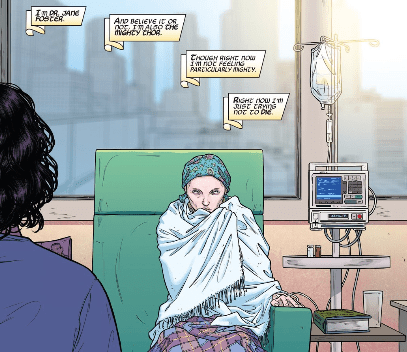 The issue opens up with Jane Foster getting chemo therapy. She knows she’s dying and goes through the pains of chemo therapy. The pain of having cancer. Jane sees a news report of a Roxxon satellite crashing to earth. Jane takes her IV out and calls to Mjolnir. She becomes Thor and saves the day! Jane reveals that every time she becomes Thor it quickens her death. When she picks up the hammer her chemo is taken out of her system. Her cancer is now spreading even more. This issue also explores Jane’s other life as a senator. A war is coming and Jane is seeing the signs. There is also this looming fear of Odin that I am sure will come into play later in the series. The last page reveals that a certain villain is back and he is ready to kill the new Thor! This was a great first issue to set up the story and it felt new reader friendly. The first few pages explained Jane’s situation and why being Thor is killing her. The rest of the series is setting up for a war of the realms, which is really exciting. 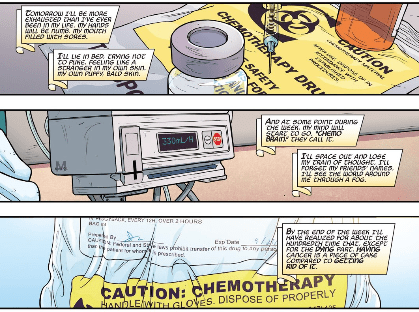 The best part about this issue was Jane’s narration, especially the opening scene where she is receiving chemo therapy. She talks about the horrible process of getting chemo therapy and that the chemo is even worse than the pain of the cancer. Jane is dying, but all she can worry about is using her power as Thor to save people. A subtle thing I liked about Jane’s scenes was how many references she made to Asgard and Norse related things. For example when the nurse asked Jane how she was feeling during her chemo therapy she whispered she felt as cold as Jotunheim. 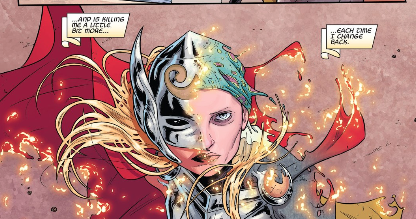 I really liked that there was 50/50 panel time for both Jane Foster and Jane as Thor. I hope they can keep that balance for upcoming issues and not focus too much on one story. Something that this issue touched upon that I hope future issues focus on is Jane’s role as a doctor. Two scenes that really stuck out to me was when Jane was getting chemo therapy she saw a woman’s heart rate go up and warned the nurse about it. Her doctor instincts were kicking in. She also showed her role as a doctor as Thor when she was helping those people out of the satellite. She was examining them before the Shield medics came to the scene. The only negative I have towards this issue is that some of the Asgard scenes with heavy Norse dialogue bored me. It felt a bit lengthy. The artwork for this book is gorgeous! Again I have to go back to that opening scene with Jane talking about her chemo therapy. The close ups of the poisonous chemotherapy drug intensified the scene for me. Then there is a splash page of a weak Jane covered in a blanket while revealing that she is The Mighty Thor, an interesting contrast. The action scenes were really detailed. There is one impressive scene where the satellite is being hit by numerous elves and this scene covers two pages. The panel had a close up on an elf with blood running down her eye with a blank look on her face like this elf is being controlled. Another great action scene is when Thor saves the satellite from crashing into the Lincoln Memorial. There was so much detail! Even with how Thor swings her hammer. The Mighty Thor has a perfect balance of a human and Godly story. This series is a must read and shows that The Mighty Thor has a lot in store for us.